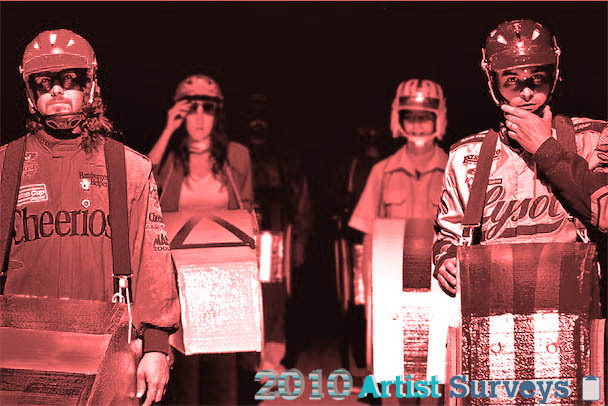 2010 Artist Survey: Josh Epstein of Dale Earnhardt Jr. Jr.
For Under the Radar’s 8th annual Artist Survey we emailed some of our favorite artists a few questions relating to 2010. Pick up a copy of Under the Radar’s Year End issue for interviews with: The Antlers, Bon Iver, Caribou,Club 8, Delphic, Rose Elinor Dougall, Gayngs, Hot Chip, Lost in the Trees, Love is All, The Love Language, Mogwai, of Montreal, Okkervil River, Yoko Ono, Owen Pallett, Plants and Animals, Mark Ronson, Superchunk, Tame Impala, Vampire Weekend, Sharon Van Etten, and Vivian Girls. Here’s a survey from Josh Epstein of Dale Earnhardt Jr. Jr. The highlight of 2010 would have to be taking part in the TedX Detroit conference. Being a part of all of that creative energy and talent was very humbling. The month of January. It was cold and 2009 wasn’t the best year, so it took a little while for the negativity to dissipate. We hope to have a record out and tour, and then make another record before the year is through. I think that there are too many special interests groups in Washington and they have become too ingrained in the system. There really is no way to operate as an altruist these days. The way of things probably stifles anyone who believes that change is possible. My feelings on Obama are those of disappointment with him but I also understand why he can’t be what I want him to be. I think that ideologically there is probably something redemptive about the Tea Party; however, as with anything—people ruin the ideas. Both. It is easier for people to hear you, and also easier for them to move on quickly to the next thing that they hear. It depends on my mood. If I’m sad and alone, then I would obviously rather listen to something more challenging. If there are a few friends over and we are listening to records, we might want to dance. Everything has a place. I couldn’t judge whether or not anyone is being unfairly hyped. I think that the beauty of music lies in its subjectivity. The trick is finding someone who’s tastes align with your own and trusting them. For some it’s Daytrotter, for others it’s Pitchfork, etc. My dog, Potato. He would probably be frightened and would freeze, so I would have to save his helpless little soul. If I could relive one day with full cognition, then it would be the day of my birth. I was birthed by Cesarean so consider your Oedipal theories dispelled. It would be amazing to see what everything was like in my family before me, though. Someone sent us a detailed note about how we can improve our recording techniques and how we should change our songs. It was really nice of him, but unhelpful nonetheless. The sad truth is that I have no real goals other than surviving and continuing to play music.